At New River Kinematics (NRK), we are dedicated to the continuous development of our core metrology software package, SpatialAnalyzer® (SA). We pay close attention to our users' feedback and regularly incorporate user suggestions into new releases. In fact, you'll find that we never stop improving and enhancing SA. Read below for the latest updates and enhancements in SA Release 2016.09.01. Click here to view this in pdf format. Projection planes can now be easily defined as part of the selection process through the SA Toolkit. 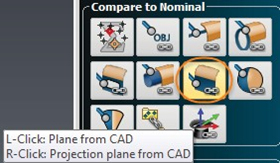 Right-clicking on either the Make Plane or Make Plane from CAD buttons will create the GR-Plane and define the projection plane in the SA Toolkit in one step. This makes subsequent projected feature construction much more efficient. Right-click properties of a Scan Stripe Mesh now includes an option to generate a cloud from mesh vertices. This can also be done for multiple meshes at once using Construct -> Point Clouds -> On Object Vertices. The resulting cloud can be very useful in that it concentrates the resulting cloud data at edge transitions and along curves where the greatest detail is needed and reduces the density on flat regions of a part. This can be used as an averaged proxy for a much larger scan, greatly reducing job file size without significant loss in detail. STL cloud import and export speeds have been greatly improved. In addition, you can now import an STL as either a mesh, a point cloud, or both at once for quick utilization. Dynamic cloud display control was added, which limits the total number of cloud points displayed at any one time while actively connected to an instrument. This dynamic display management makes it easy to measure millions of cloud points without any slowdown in performance due to graphic update processes. 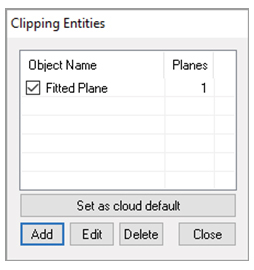 Clipping planes are defined per cloud through their properties, allowing a user to define a separate clipping plane or set of clipping planes per cloud. We have now expanded on that for the simple case where an operator wants to use the same clipping plane for multiple clouds. 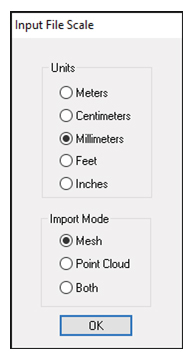 To do so we have added the option to define any particular clipping plane configuration as the system default, such that each additional cloud inherits the defined global clipping plane(s). Renaming a scan stripe cloud will now propagate through to an associated mesh (if there is one). Tweaked “Cloud to CAD Alignment” to exclude hidden points. This allows for a better result if hidden points are not deleted. The ability to add a callout directly to a Scan Stripe Mesh has been added. In doing so, we added the ability to specify anchor points for leader lines in Cloud and Mesh callouts. 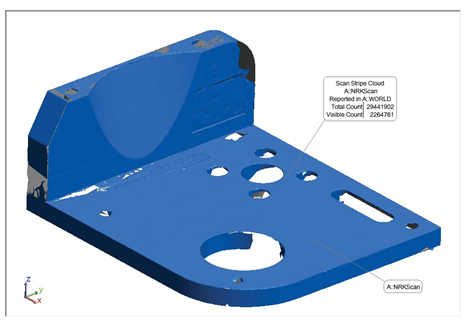 This control includes a right-click callout menu option to redefine the callout anchor point. The Callout Properties dialog also now includes a “type“ indicator option. A “Reporting Frame” option was added to the Callout properties displayed for Objects, Geometry Relationships, and points/groups relationships. This can be very helpful in identifying when details on a feature are reported relative to a reporting frame other than the current working frame. Cloud report tables have been added which present basic details on point clouds such as the total point count and number of visible points, probe off sets, and the status of clipping planes and meshs. The “Report Option” Dialog use by Group-To-Group Relationship, Points to Objects Relationships, and Vector Groups has been rearranged and streamlined for clarity. The “Details” table checkbox now controls the visibility of the point details table. When disabled the corresponding options are also grayed out including “Record Format” and “Point Naming and Ordering” sections. In relationship or vector group reports, if no tolerance is defined for a reported component, the field is not colored to more clearly indicate that the no tolerance was defined. Added sub-sampling information for cloud-based Geometry Relationships within their reports to more accurately reflect the fit statistics. AutoMeaure from SA with a Leica tracker now allows a user to measure reflectors of different types and diameters. To do so, it harvests the reflector definition from nominal measurements and sets the correct target information with each measurement command. The “Measure All that Can be Seen” has also been improved. API trackers can now send measurements to SA at the full 1,000Hz. A check for minimum joint encoder change was added to prevent excessive graphics updating during measurement. This ensures that no updates are sent when using ToolBar mode, and the arm is docked for example (unless the arm is moved). An option to send the classic cloud data format was added for cases when you don’t need meshing, but need maximum speed. Go to Options >> Send Scan Stripe Clouds (For Meshing). This defaults ON. Uncheck for original format. 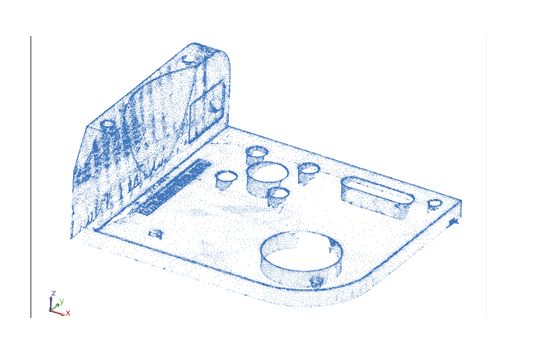 Assembly Guidance SDK Update and interface additions. Added ability to resize the dialog for convenience of presentation on small screens. Added different data types (integer, double, Boolean, string) support for HTML <input> “radio” buttons. Added support for SA embedded files. Improved user interface for text management. Now, the “Edit Text” and “Notice” dialogs are resizable, support word wrapping, and have vertical scroll bars. Interested in learning more about SA? We regularly update the SA User Manual (which is installed when you install SA) to reflect the most recent updates and changes to SA. Click here for the download page.